The Zika virus (yellow) is strongly suspected of causing birth defects. Zika virus is a mosquito-transmitted infection related to dengue, yellow fever and West Nile virus. Symptoms are mild and include fever, rash, joint pain and conjunctivitis (red eyes). Just one in five people infected becomes ill. Hospitalisation is uncommon and deaths are rare. Zika is primarily spread through the bite of an infected Aedes species of mosquito. Pregnant women can also pass the virus to their babies during pregnancy but how and when this happens is unclear. Those infected can pass the virus on through a mosquito bite for about seven days after infection. There are no reports of transmission through breastfeeding, but in a few cases the virus has been reported to have been passed on through blood transfusion and sexual contact. The latest outbreak is in 23 countries in the Carribean, Central America, South America, Mexico and Puerto Rico. Past outbreaks have been in Gabon, Egypt, Nigeria, Senegal, Sierra Leone, Côte d'Ivoire, the Central African Republic, Cambodia, Micronesia, Malaysia, Pakistan, India, Thailand, Philippines, and Indonesia. 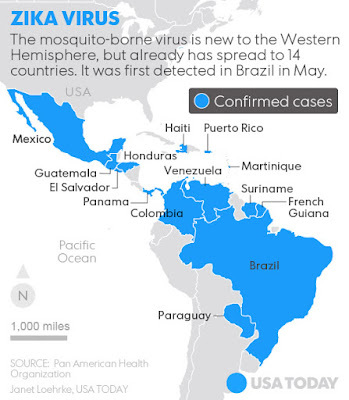 How did Zika get to Brazil? Nothing has been proven but Zika may have been brought to Brazil by participants of the Va’a World Sprint Canoeing World Championships, held in August 2014. Athletes came from French Polynesia, New Caledonia, the Cook Islands and Easter Island. It has also been suggested that Zika was brought by Asian tourists attending the 2014 FIFA World Cup, raising concerns that the Olympics, starting in Rio de Janeiro on August 5, will result in further spread of the virus. A blood or tissue sample from the first week in the infection must be sent to an advanced laboratory. The virus can be detected through sophisticated molecular testing that seeks out the active virus, which lasts in the body for about a week. Research is being done to develop a rapid test which could look for antibodies after a patient has recovered from the virus, making it possible to test for immunity. There is no vaccine or specific medicine currently available and treatment is normally focused on relieving the symptoms. Can a vaccine be developed? In theory a vaccine is possible but development testing and trials for human vaccines normally take years and cost hundreds of millions of dollars. A number of companies, including Inovio, Hawaii Biotech, GSK and Sanofi are developing or considering working on a vaccine. 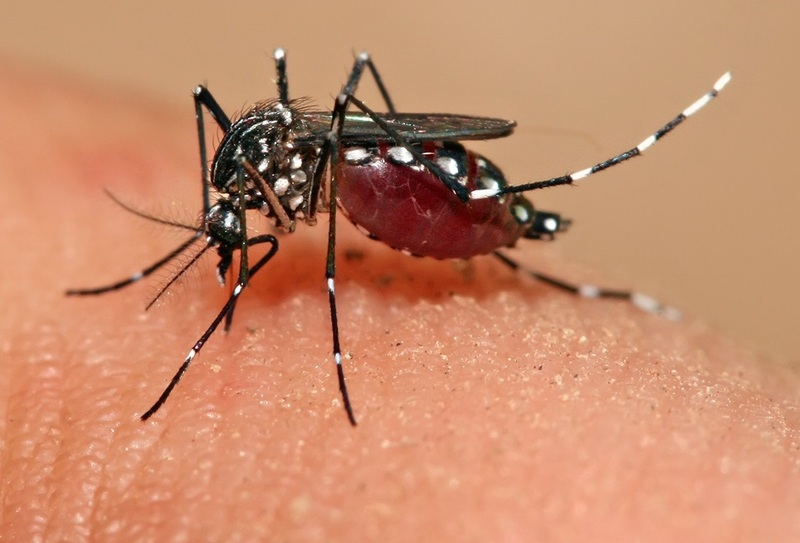 Last year Sanofi received approval for the world’s first dengue vaccine. Dengue is closely related to Zika but Sanofi is cautious about whether it could be adapted. 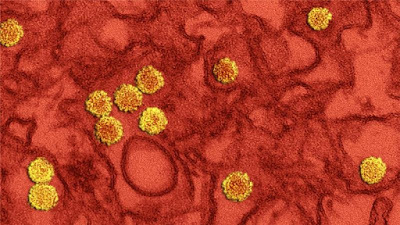 “There are too many unknowns about Zika to reliably judge the ability to research and develop a vaccine effectively at this time,” it said in a statement. What is microcephaly and how is it linked? Microcephaly is a birth defect characterised by incomplete brain development and an unusually small head. It is a life-long condition with no cure or standard of treatment, and is linked with conditions such as seizures, developmental delays and intellectual problems. Microcephaly is normally uncommon. In the US, there are typically between two and 12 cases per 10,000 newborns. The condition is being reported in the worst Zika-affected areas in Brazil at dramatically higher rates: 100 cases for every 10,000, or 1 percent of births. Research from Brazil has suggested there is a correlation between the location and timing of this Zika outbreak and the increase in cases of microcephaly, but there is currently no proof that the virus causes the birth defect. However, Zika virus has been found in the amniotic fluid of pregnant women with the virus and in the placentas and brains of miscarried fetuses with microcephaly. The World Health Organisation's Director-General Dr Margaret Chan says a causal link is "strongly suspected". Why was the potential link between Zika and birth defects not previously observed? In areas where Zika has been active for decades, such as Central Africa and Asia, most people are infected early in life, so the risk of infection during pregnancy is small. The population in the Americas has not had exposure to the virus until now. This means more women are now being exposed to the virus for the first time during pregnancy, possibly increasing the risk of birth defects. This is why public health officials are telling women to avoid getting pregnant, at least until they have had the virus, or Zika has been brought under control. Can GM mosquitos stop the virus? British biotech company Oxitec has produced genetically modified Aedes aegyptimosquitoes by introduing two genes into its DNA. One of them makes its eggs glow under UV light, helping with identification. The other causes ithe mosquito's offspring to die. Oxitec says that by releasing the GM mosquitos into infected areas populations of Aedes aegypti can be reduced by more than 80 percent, thereby reducing transmission of Zika. Oxitec says there is no way the mosquitos' modified DNA can transfer into humans or other mammals and insects, but public fears over genetic modification mean the technique is controversial.